Donald Miller's flashy child, Blue Like Jazz, tends to get all the press; but Searching for God Knows What is the one where he grabs the face of Christian Culture and encourages it to look in the mirror. His dissection of how the Garden of Eden took a greater toll on us than we acknowledge is a great thread that's sewn throughout. One more week of recommending you watch something I haven't seen yet... (But it worked out if you watched America or ER this week...hi Dr. George.) 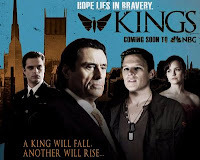 NBC premieres "Kings" on Sunday, March 15 at 8/7c. This show is a contemporary take on the life of King David from the Bible. There was the cheesy when I heard David's last name was "Shepherd" but I also learned crazy Ian McShane is in it (I'm in for at least one eppy.) Here's an article where the Executive Producer explains how faith and sci-fi will mix and mingle. I've had an unshamed music crush on Kelly Clarkson since day one of her American Idol stint. I love all her albums, including the poorly received "My December" (it deserves a second listen.) Her new CD "All I Ever Wanted" debuted this week and I haven't stopped listening. This song, "Already Gone" is a definite keeper. Question: What does dreamer and grounder mean? I'm confused. I get the dreamer part, but grounder? "Searching for God Know's What" is my fave. Good recommendation. We're watching Donald Miller's video about Story in our Sunday School class - he is awesome, and I have to find more of his stuff. i love donald miller. my favorite was "to own a dragon" which i think is for people growing up without a father but i loved it so much anyway.